Meadowood’s exciting new expansion is coming soon! What is Rehab like at Meadowood? Watch our new resident video and see. What activities do our residents love most? 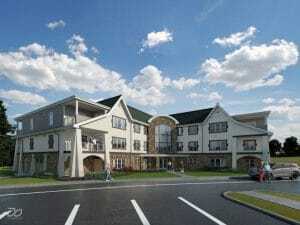 Meadowood Senior Living new expansion project, The Grove, broke ground in October 2018. Containing 52 new residences featuring all-new floor plan options, each home will feature a “corner view” through large windows, overlooking a beautifully landscaped courtyard or one of many tree-lined views. Additionally, the spacious new residences will feature large, open floor plans with ground floor indoor parking, much of which is featured in the video below. Read The Grove expansion announcement. With limited availability, the best time to reserve one of these light-filled, brand new residences is now. Use the button below to download your free information kit about The Grove at Meadowood today or call us at 610-584-3998 and let us help answer any questions you may have. Update: The Grove at Meadowood breaks ground! Click here to read more and stay updated on all our expansion efforts as they unfold.